A second reality check, to complement the item I just posted: How did the US federal deficit get so big? (#1). This one is less detailed, but in some ways more sweepingly comprehensive. I think the graph below, from the Center on Budget and Policy Priorities (based on estimates from the Congressional Budget Office), is fairly self-explanatory. But here are a few of its implications. That second category includes reduced federal tax revenues and the cost of various compensatory programs that kick in more or less automatically (e.g., increased unemployment payments)—at least, they used to function as "automatic stabilizers" before the Congressional Republicans embarked on their rule-or-ruin strategy of indiscriminate and monolithic obstructionism. It also includes policy initiatives undertaken during the Obama administration to counteract the recession, including the 2009 economic "stimulus" (without which the economic situation would almost certainly be much worse than it actually is right now). 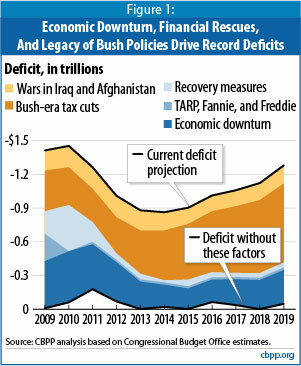 If we leave out the Bush-era tax cuts, the unfunded wars in Iraq & Afghanistan, the direct effects of the economic crash, and the recovery measures undertaken during the Obama administration ... then the resulting level of current and projected federal deficits is indicated by that black line down at the bottom of the graph ("Deficit without these factors"). The long-term costs of Obama administration recovery measures are indicated by that light blue band running across the graph. Where does the rest of the deficit come from? The next time you hear right-wing propaganda blaming the mushrooming federal deficits on "out-of-control spending" under Obama, propaganda that tends to get mindlessly repeated by too many pundits and alleged journalists, please keep this graph in mind.